News now of another sale as Frank Grzeszczak and his son Frank Jr at International Yacht Collection find a buyer for the 25.6m motor yacht Dividend, a central listing with Whit Kirtland at Bradford Marine Yacht Sales. 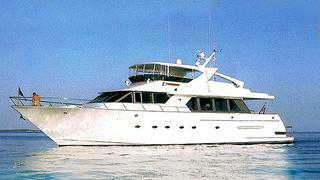 Built by West Bay Sonship in 1998, she accommodates 8 guests in a master suite, VIP stateroom and a double and twin. She is powered by twin 1080hp Detroit Diesel engines giving her a cruising speed of 16 knots and top speed of 21 knots. Dividend was asking $1.95 million.